Ragnarok, Shmagnarok. Thor Is A Bore. 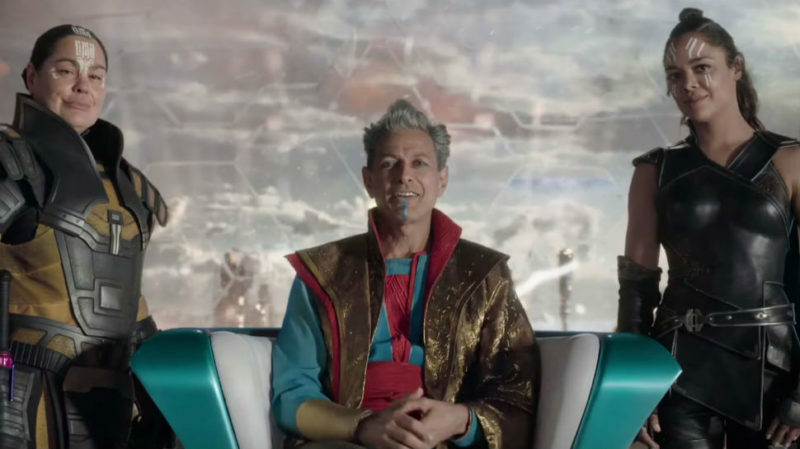 There is a reason to see Thor: Ragnarok, and that reason is Goldblum. Goldblum goes full Goldblum as the Grandmaster, ruler of some dumpy planet where he stages fights like a Roman God in his personal Colloseum. He plays the part like he’s in a classic sword-and-sandals epic, all spider-fingered and stuttery, quick with bons mot and giddy at the sight of his enslaved warriors dying for his pleasure. He almost makes the movie worthwhile. He’s not enough. I actually found myself nodding off during the back half of this otherwise typical Marvel CGI carnival. I wonder, is there a soul on earth who thrills to the video-game-bland fight sequences in these movies over the witty repartee? Can’t we just have the fun parts for once? Or is it that if we don’t eat our meat, we can’t have any pudding? All I want is pudding. I want Goldblum’s witticisms. I want Thor (Chris Hemsworth) and Banner (Mark Ruffalo) chumming about. I want Loki (Tom Hiddleston) being a weasel and making snide wisecracks. I want director Taika Waititi as an imprisoned rock-man deadpanning gags in his soft New Zealand lilt. Which, yes, a taste of all of this I get, but tucked away as these joyful moments are into a non-story about CGI blobs bouncing into each other, I am rendered logy and inert. What’s next but a nap? Thor: Ragnarok is somewhat baffling in its lack of a coherent story. Or is it, rather, the opposite of baffling? Years or screwing with the script, writer after writer, a director hired at the last minute great at letting improvising actors crack their best jokes, yet stuck with a stepping-stone chapter in a never-meant-to-end story with a cast of thousands, should we expect anything like coherence? 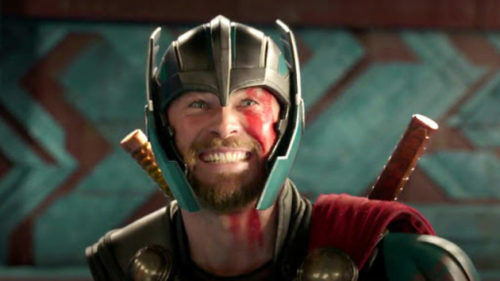 Every time a new Marvel movie opens, we’re told how very much a stand-alone movie it is, yet every one turns out to be a senseless muddle of universe-saving with no beginning and no ending. Thor greets us literally at random. He’s trapped someplace, and then he’s not, and then he’s home, and he wants to find his dad, Odin (Anthony Hopkins), who’s not at home, so he finds him elsewhere, and then his dad dies. As soon as Odin dies, Thor and Loki’s sister, Hela (Cate Blanchett), appears, all black-clad and evil, and announces that she’s taking over Asgard, home of the gods. OMG! It’s the Hulk! Who knew? Sounds like your basic comic book plot. 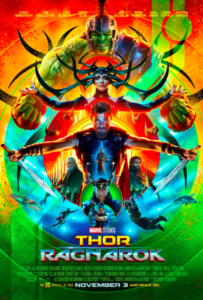 Thing is, Hela in Asgard is like the B-story in a sitcom. The A-story is where Thor and Loki wind up on Planet Goldblum and Thor has to fight the Hulk, who’s been hulking it up there since we last saw him in whatever that other movie we last saw him in was. There must be a half-hour of build-up to Thor having to fight Goldblum’s “champion.” WHO COULD IT BE?! we ask ourselves feverishly. Or we would, if the movie wasn’t sold to us with Thor fighting the Hulk as the main attraction. This wouldn’t be a problem if they just went ahead and fought. Instead it’s played as the epic big deal the whole movie is centered around. Which, unfortunately, it has to be played as, because there’s nothing else going on. Do the gladiators stage a rebellion? Is Goldblum overthrown? Do they make it back to Asgard for a final, hours-long CGI blur indicating the defeat of Hera? You tell me. I fell asleep. Agreed. Waiti is funny, and there is a bunch of funny stuff in this, but the rest is like cold syrup. I hate to inject even a modicum of reality into these pictures, but I’m still trying to determine if the total population of Asgard is 207 or whatever, minus the 150 soldiers who die in the beginning, plus the 103 skeleton beasts and a giant wolf. All of whom get on one spaceship. You mean we’ve been fighting for three movies over who gets to be king of that? They need some fire-demon to destroy it? I blame Marvel. I bet Waiti did the best one could. And I’m going to watch Hunt for the Wilderpeople again.